God. Just look at that thing. It looks like an actual vehicle, and not just a rotten carcass about to return back to earth. This overly ambitious off-road project is coming down to the wire; here’s what happened on my first road test with #ProjectSlowDevil. The first thing I did was run some numbers on the rear diff, because I noticed that the ring gear looked bent. A Jalopnik reader named Pete came over with his handy dandy dial indicator, and we measured ring gear runout. What we found was that the ring gear was clearly being pulled in by the bolts in one spot, since the flange had been pried open and bent after the bolts backed out and rammed into the bearing cap. That left a gap between the ring gear and carrier, so when I bolted the two back together, the ring gear was pulled in towards the carrier at that one spot. At the worst point, we measured 28 thousandths of an inch of runout, which was way more than the three thousands the spec called for. We slapped some copper crush washers in the gap and bolted it back up; after a few tries, the best we could do is 13 thousands of on inch of runout. Needless to say, that diff might be blowing up at some point during the trip. 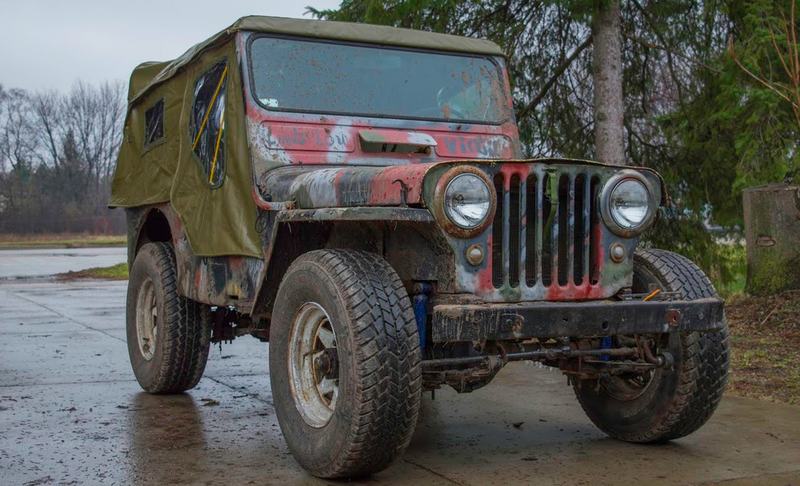 Content with our half-assed job, we filled up the fluids, bled and adjusted the brakes, and then Brandon bolted on the front grille—that’s when the Willys actually started looking like a Jeep again. After picking up some awesome white wheels from a reader named James (who had them on his awesome Willys CJ-3B), and mounting the 31-inch tires I bought from my friend Steve (who had them on his awesome CJ-7), we bolted those big meats to the CJ and things started to get even real-er. Since the Jeep didn’t have any lights, we decided to do the first post-rebuild drive in my backyard. That ended up being either a poor decision or a brilliant one, depending on your perspective. We got stuck immediately. It had been raining hard here in the Detroit area, so I should have known my back yard was a huge slippery mud pit. After engaging four-wheel drive, the Jeep lurched forward deeper into the pit, but eventually got sucked up in the muck. After five or ten minutes of Brandon hammering on that newly-rebuilt engine, my friend Clark gave the Jeep a nudge. On Sunday, I got a big surprise from a guy named Bob, who read about my trip on the excellent CJ2A Page forum, and wanted to help. Bob is a bit of a soft-top aficionado who stitches tops for old Willys Jeeps and Land Rovers, and his work is just incredible. He drove all the way up to my house from Cincinnati to drop off his top, which attaches to the rear posts on the quarter panels, and slides into the channels on the windscreen. The doors fold in three sections like a bat-wing, and the sides cinch down using the footman loops inside. Honestly, I could write an entire article on the top, because it truly is a work of art. I cannot thank Bob enough. The first test drive went OK. We got the Jeep up to about 45 mph with plenty of throttle left, which is surprising, since the engine only made 60 psi of compression before our rebuild. Maybe those new rings made all the difference. Second gear is a bit of a problem, though, as I haven’t determined the root cause yet. I did find that the nut that secures the transmission main shaft was finger loose (I stupidly forgot to torque it down), causing lots of play in the trans. I fear the transmission will need to be dropped again and rebuilt, and I’ve only got about five days before my departure. On top of that, I’ve got to figure out how I plan to fasten the body to the frame, and I need to get that driver’s side fender on. It’s going to be a long week. Notice How There's Lots Of Brown In These Pictures. Thanks Fe2O3.